I will ask him if he would part with it. You wanting the heads to or just the machine? N7 is not a new combine so if it completely gone through to make sure that it has the ability to put in a days work without stopping then yes. Machines only make money when they are running and so does the farmer you are working for. They were a heck of a machine in their day. Capacity and comfort were second to none. Watching a N7, oh so many yrs ago in barley, impressed me so much I had to own a gleaner lol. There were 3 grain trucks hauling from it on the go and you could see the yard from the field and they couldn't keep up. She was rolling coal hard and flying in that barley and then would have to stop lol to wait for a truck. I still can't believe how well they do in barley. They manage to keep it in as well no matter how hard you seem to push. They were great in Barley IF they had the return to cylinder or if it was hot as ****. Cool conditions with those returns dumping straight back on the shoe made em slow as buggery. The returns just keep circulating and build up to overload the shoe. I was smoking along with a Cummins repowered N6. Temps around 35deg, soon as the seabreeze came in and it dropped to 24deg had to drop speed to half or it became a seeder not a harvester! Guys that no-till are pretty concerned with residue management. If you are stuck on the N7, try to find the very last ones made that essentially had a R7 tail end on it, or one that has the super spreader retrofit kit on it. Or, buy a R7, essentially a R70 with an N7 powerplant. if you plan on doing wheat, plan to get one with return to cylinder, no matter the model. IMO dont get scared of the Deutz, I had a 91 R60 and loved it. Sold the machine due to processor condition (bought it out of a pasture, sat for 5 years without the traps open) but loved the engine. The P3 machines (89.5 and up) have a much more small grain friendly cage sweep design and has a little more concave area. Our farm purchases a combine soley on its ability to do an excellent job in all of our crops, while being fuel efficient, reliable, ruggedly built, and easy to repair. That is why we choose a Gleaner. Its a late model, i wouldn't be afraid of one. They are great combines if they have been cared for. I own a R7, I've had very little problems with it in the last 3 years since i bought it. Mainly just replacing old belts and rubber pieces such as hose since it does have some age. I really wouldn't be afraid of a R70 with a duetz either, as long as they are kept clean and fix any leaks. Have one in the R50, its one of the most fuel efficient engines you can find. The biggest down fall is parts prices, they are about double the price. Can overhaul a 426 cubic inch (N7 516 block would probably cost a little more)Allis for $7-8000, its about $15-16000 for the duetz in the R50, or at least thats the last ive heard from the dealer i use. What ever way you go, Gleaner is hands down simplest combine to work on and to operate. Who ever says you need a new machine to do a good job is full of bull. A well taken care of older machine can do about as much as a new one and do just as good of job if you pay attention to detail. I wish you luck. Can overhaul a 426 cubic inch (N7 516 block would probably cost a little more)Allis for $7-8000, its about $15-16000 for the duetz in the R50, or at least thats the last ive heard from the dealer i use. About the same for me(actually cheaper to overhaul the 516(N7)), also do parts still have to come from Germany? That's the biggest reason (besides fire) I have stayed away from deutz. The simple answer is no ... don't be a fool. The N6 & N7 broke many who were very successful with L's, G's, CII's, C's, and A's. Actually harvesting is a mere 5% of the groundwork. You must be a politician, mother, father, manager, mechanic, psychologist, rigger, welder, mechanical engineer, electrical engineer, magician, and weather lucky. The expenses are murder ... fuel, tires, oil, parts, insurance, wages, meals, interest, lodging, fees, permits, and 1000 more. You need support equipment, service truck, pumps, tanks, welder, torch, fire extinguishers, compressors, tools, parts, roller chain, sickles, spare tires, oil, filters, bearings, springs, combine trailers, header trailers, pickups, trailer house, and 1000 more. You must be 10 places at once. You must not let your help ruin your reputation. You must watch like a hawk for unsafe situations. You must treat your customers crop as if it was your own. You can't back over augers, exit quonset huts with the bed up, turn too short and knock down light poles, leave truck stops and knock down signs, break the law, have your help break the law, go too fast, go too slow, be broke down, have drivers get lost, back into the farmers new pickup, and 1000 other things. You must be able to convince strangers you are the man for the job. You must pay everyone before moving on. Again ... don't be a fool. 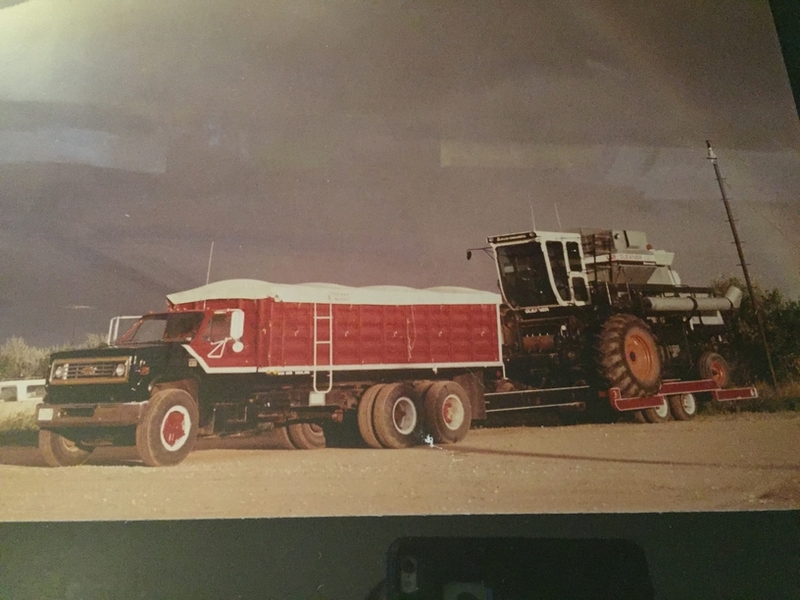 My grandad started in 1945, sleep under the bed of the truck, baths in stock tanks, combine atop truck with header atop the cab, the whole shebang. I went for 15 years back in the 1980's till graduating with masters degree in engineering. My stuff was old but looked and ran like new. My grandad told me I was a fool, and I was. But we both knew there is no cure for the desire to thrash wheat with a Gleaner. I still have one and farm a whoppin 65 acres, but the day I cut it is the best day of the year. Seek better opinions, but I'd steer clear of the N Series. wornoutjunk.......The early N-6's gave Gleaner a bad name mainly because the engines couldn't stand the RPM's. Seems about everyone heard about someone that had one throw a rod. Nothing wrong with the Series 3 Gleaners ('83 and up) they are as reliable as any other color machine of that era. The N3/N4 became the R40/50 in 1987. In late 1985 or early 86 the local salesman asked dad if he want to go through an experimental program with Gleaner on a combine. He said yes and got one of the production run of 7 unbadged experimental machines with the 70 inch long rotor. The serial number plate has stamped N4 for the model number in it. We still have the combine, only one of the 7 that I know of left. I would love to find that one that is in that picture badge N7, the cab is just awsome looking. I wonder what the controls were like.